Transporting the onlooker into an alternate reality, In the Park 1972, from 2002, condenses Ilya Kabakov's continued preoccupation with presenting the deceptive and vulnerable nature of memory. 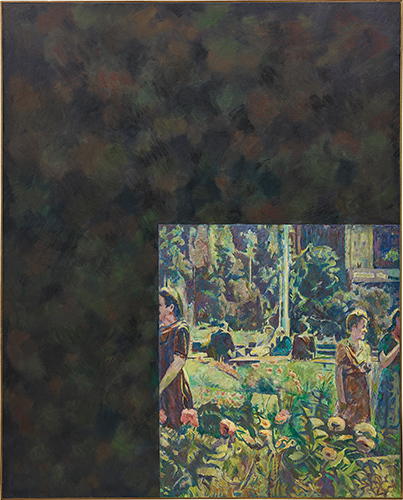 A distinguished canvas, the present work was exhibited at Sean Kelly Gallery in Kabakov’s first gallery exhibition of paintings in New York in 2008. A testament to his enduring legacy, the artist has recently been celebrated together with his wife - and collaborator - Emilia, at the Hirshhorn Museum in Washington, D. C. and the Tate Modern in London. Central to Kabakov’s oeuvre is the notion of memory and forgetting, commenting and reacting to the dogmatic rewriting of Soviet history that cultivated endless instability within the collective cultural memory. Merging memory with wistfulness, the artist engages with the pictorial and visual culture of the Soviet Union. Having grown up in the Soviet Union, his nostalgic canvasses serve as a portal, a means of escape from the standardised artistic norms of Soviet Realist propaganda and social restrictions imposed on Communist Russian society. With his controversial and thought-provoking artistic output, Kabakov is regarded as one of the leading creative theoreticians of the past three decades and a crucial figure of Moscow Conceptualism, the prominent Russian art movement of the 1980s. Presenting the viewer with a painterly and wholesome scene, a seemingly Russian landscape, the canvas is evocative of the homegrown Soviet Socialist Realist style. Kabakov takes established Soviet Realism as a starting point from which to depart, recalling the work of Aleksei Vasilev. The landscape is stripped of its traditional structure, deconstructing the pastoral scene as the artist offers an alternate reading of the history of 20th century Russian art. Overpowering the plane with the dark, geometric border, Kabakov juxtaposes the naturalistic with the abstract. Transient memories draw the viewer towards the artist’s contemplative realm whilst the gloom of the painted perimeter forces the viewer to reexamine the meaning of the traditional familial scene. Placing the pastoral scene within a new context, the artist carefully brings the modernist abstract qualities to the fore and elevates the canvas towards abstraction. Challenging the traditional aesthetic, the work psychologically comments on the difficulties and restrictions on creativity faced by the artist and his generation in the USSR. In its title, In the Park 1972 directly references the year of Alexei Kosygin’s 1972 Soviet economic reform. Whilst not explicitly citing the economic restructuring, the artist raises the issue of the reform which was never fully implemented. Purposefully presenting us with a seemingly idealistic landscape, Kabakov poignantly questions and decontextualizes the social structure of the Soviet society through his artistic medium and probes the controversial and critiqued nature of proposed and unsuccessful changes. In In the Park 1972, the aesthetic roots of Soviet imagery are no longer grounded. Confronting the viewer with a paradox and building obstacles between the viewer and their perception, the artist underlines the challenging and controversial nature of publicised reality. Exploiting the fragility of memory, Kabakov references the impressionable and unreliable nature of recollection. Deconstructing preconceived artistic norms, the artist invites the viewer to engage in the reciprocal dialogue of his composition. Critiquing and commenting on Soviet society, its values and realities, Kabakov transforms a tranquil and rustic scene into a dimensional canvas of historical and political significance. In the Park 1972 is exemplary of Kabakov’s ability to question notions of perception and memory, juxtaposing art historical and familiar scenes with the future of the modernist model of creativity.